Specifically designed to stand up to the rigors of long hours of riding. This extra heavy, machine washable wool pile fabric provides the ultimate protection for your horse's back. Wool is a great natural fiber for the horse. No other fiber combines comfort and durability like wool. It will absorb up to 80% of it's own weight in moisture. It is porous and permits circulation of air and moisture. The cuticles on each strand of wool fiber grips better than synthetic fiber, helping prevent slippage while riding. It is naturally resilient and long lasting. It resists dirt penetration better than cotton or synthetic pads. Care and cleaning is relatively easy. the pads may be washed on a gentle machine cycle and tumbled dry on low heat or by hanging. Fibers can be fluffed with a pin brush. 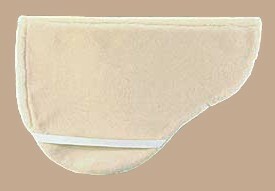 REGULAR (PADWBSP) has Woolback fleece on both sides of the pad. It is 38.5" x 27.25". TRIPLE THICK (PADWBSP3) has three layers in the weight bearing area of the pad only. It is 38.5" x 27.25".